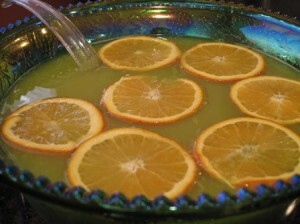 With lots of green for St. Patrick’s Day, I am contributing with a Green Punch recipe (non-alcoholic), for those who are too young, or not so fond of alcohol, to be indulging in Guinness, or other green beer. This is a quite refreshing punch, suitable for any occasion. Pour 1 quart of hot water into a large saucepan, and dissolve the gelatin. Pour the cooled gelatin into a large punch bowl. Stir in: pineapple juice, orange juice concentrate, sugar, and 4 ½ cups of cold water. Just before serving, pour in the Ginger Ale. I skiped the sugar, because to me the punch is sweet enough without it.